Looking at the old archives to see if I could find a tutorial on pulling planers and noticed today is your birthday. Hope you had a good one. Posted: Sat Dec 22, 2007 8:10 pm Post subject: Thanks!! Hey, thanks man. It turned out to be a pretty good day finally (see Sinclair report). It was going to be a good evening, too, but the heavy drizzle has set in and we called it before it started. Guess I'll just have to crack a few silver bullets and relax tonight. It's also the 'Soup's 2 year old birthday today and I'm proud to announce that it's been a great ride thus far. Thanks to all who have joined, learned, taught, laughed, cried, bitched, been concerned, been vigil, updated their locations, caught fish, entered the fish off, and all those other things that are really important too. I appreciate all you do (even if you're just a lurker/moocher because you probably do some good somewhere with the info you pick up on the 'Soup). Oh, I'll be doing a non-location-updater sweep tonight, so expect a small decline in member numbers. I will also be figuring out the whens and wheres of the 2008 Striper Soup Troup Group get together very soon, suggestions are welcome. 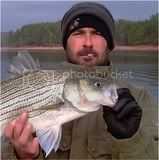 I'm leaning towards having it in Tennessee, possibly fishing on Watts Bar, or Percy Priest, Old Hickory. It will be a central location for most and the fishing should be grand. Posted: Sat Dec 22, 2007 8:28 pm Post subject: Happy B-day to the CHEF and his Soup! As I said in replying to Ezell's post on TN regulations - the SOUP is a great resource and benefit to stripers and striper fisherman. And many , many more to come !!! I fish, in part, because its an anti-social endeavour that puts you forever outside the mainstream masses without actually landing you in the nut house. Happy Birthday, Shawn, and Merry Christmas! Happy birthday, and thanks for a great site. Marry Christmas to everyone on the soup. I am pleased that we have so many great fishermen that is willing to add something into the soup to spice it up. Happy b day Chef. 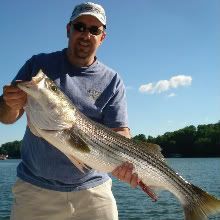 I've learned tons of good info here and met some great striper fishermen along the way. I have no doubt I've caught fish as a result of things I learned , directly or indirectly, from this site. How frickin awesome! Once again, I'm surfing the Soup via "Search" and stumble upon this. The keyword "Lurker." A certain individual keeps popping up at the bottom of the screen with zero posts. Not really sure how you can NOT post here on the Soup. Try and make one...you might just like it! Anyway, I thought it was appropriate. Happy Birthday to the Chef, the Soup, and to anyone else who's Birthday it is......and MERRY CHRISTMAS! VERY FREAKY, making this discovery as FWF made it last year. Happy Birthday Shawn, and Merry Christmas! HAPPY BIRTHDAY CHEF. Had a blast with you this weekend. Thanks again and I'm digging the ring tones. JT asked about a million questions so we had fun talking about it. Hope you and the ole lady had a good Sunday as well!!!! Happy Birthday, Shawn, hope you have a great DAy! Happy B-day and Merry Christmas!!!!!!! Happy Birthday Shawn. Hope you ain't working today. Posted: Mon Dec 22, 2008 10:52 am Post subject: Thanks guys! Workin like a dog today in the cold. It's all good though. I got some photos to post from this weekends trip and a video that needs some serious editing. I snuck up to TN trying to get a big birthday present and it wasn't meant to be. We barely broke 16 lbs. Don't forget the Soup has the same birthday as me! It's 3 years old today! Posted: Mon Dec 22, 2008 11:25 am Post subject: Re: Thanks guys! 3 years old? Yer a big baby, Shawn! Do all you can with what you got!!!!!! What a tradition...HAPPY B-DAY to Striper Soup and its personal Chef!!! Mike (FWF), bet you had no idea what you were starting! Ahhh yes. HAPPY BIRTHDAY seein stripes CHEF! You da man! It's funny I ran across this thread last night and vowed to remember to post it again. Glad you caught it because no way I was going to remember tonight. Oh yes, and Merry Christmas guys! Bringing up the rear, what a view! LOL! To the soup and the chef! Happy birthday Chef, thanks again for all you do! This is by far the BEST website I have ever found....can't wait to get into it more and contribute! Happy B-day my friend and hope you have many more. Happy Birthday Shawn. Merry Christmas to all. Posted: Tue Dec 22, 2009 7:59 pm Post subject: Raise the glass to the Chef! "I've spent 85% of my lifes wages on fishing, the rest I just wasted..."
MY LONG ARM OF THE LAW IS A 7' UGLY STICK!!! Happy birthday Shawn, hope you had a good one. HAPPY BIRTHDAY to our founding father! Enjoy Shawn! Whats left of it. Thanks guys. I was able to get out on the water with my wife and she got her PB striper at 12#! It was perfect weather as well. She said "it's like crack" after catching that fish on 8 lb spinning. Posted: Fri Dec 25, 2009 9:47 am Post subject: Happy Birthday!!! Happy Birthday and a Very Merry Christmas!!!! That's rite! Soup turns 6 today, I turn 35. Happy Birthday Shawn!! Wish I was 35 again. Happy Birthday to the Chef and the Soup! Happy Birthday Chef Shawn and the Soup! This happens about the same time every year doesn't it? Posted: Wed Dec 22, 2010 10:27 pm Post subject: Happy Bday Dude! Hey Shawn Happy B-Day and hope you have a Merry Christmas!~! 'O' to be young again with all the toys I now have!